With no definitive idea on how many rooms or haunts we wanted to run, I started searching for ideas on what to include in our haunted house. It became somewhat discouraging as I was struggling to put together a well thought out haunted house, then again I was a first timer. As I put in more time I started to jot down a few ideas that I liked. Early on during the layout stage, the only given areas were a graveyard, since we had many props for it. I also included a spider’s lair that I initially thought could be the entrance to a mausoleum as the final room to our haunt. One of the first ideas I ran across was the colored masks hanging on dark walls. We would either hide actors in the plastic or have them looking through random masks. It wasn’t long after that I found some great images and plans for the dot room, something I wanted to accomplish, as I loved the idea behind it. We did have a prop owned by the school called Frank N Cuted that would be included, but we didn’t know how quite yet. Yet more Internet surfing and I found an idea for an ink blot room. The general idea was to place an actor in the center of the room, in shackles with all sorts of Rorscach inkblots around him, on the walls and hanging at various heights. This description would be the basis for our ink blot hallway, since we didn’t have enough space for an entire room. Hall of Faces: After entering the haunt the first section guests came to was the Hall of Faces. I don’t have many good comments about this area, as I failed on a few levels. First, the hallways were too wide at 3′ before exiting. These should have been narrowed down to 2′, but that would not have resolved the other problem. I had originally planned on walls full of different colored masks hanging at various heights. I ordered 25 hockey masks, but failed to read the description to see they were fluorescent. It wasn’t but a week later and I found white face masks and placed an order for 10 dozen. Unfortunately I received bad news that they were back ordered and would not see them for4-6 weeks. it also left me very short on hockey masks, as these too were sold out. Now we had had wide corridors and very few masks. Mark did a fine job filling the walls as best he could, but they were still sparse. He did place 3 scarers in this part of the haunt, but we missed out on the desired effect. 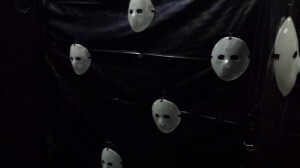 We did add a black light that made the hockey masks glow, but I feel this was a very weak way to begin the haunt. Dot Room: This room was the centerpiece of our haunted house this year, mainly because of the time invested to paint the sheets. I had planned 2 weeks to prime and paint all the 2″ circles on the sheets, based on this web site. Granted I didn’t put 8 hours a day into the sheets, but we finished the last sheet the Thursday before the Harvest Carnival. In fact I had to give away 3 sheets in order to get them all primed and painted. As per the instructions I found, I used a spray paint can lid to draws circles on all 6 sheets. We then used Gesso to primed the fabric. 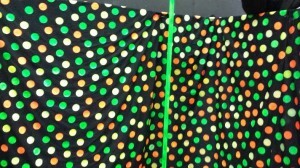 At one point I had a few orange, yellow and green circles on a sheet, I took the sheet to look at it under a black light. The problem was quite apparent, you could not tell the difference between yellow and green. Why? I had not primed the fabric completely white with the Gesso. Any black that came through seem to make the yellow and green look similar. Another problem could have been that I purchased neon orange, which was great, but when compared to the fluorescent yellow and green these colors were not as bright. The root of the problem, as I just spoke of, the fact the Gesso did not completely cover each black circle. In the room, I was frustrated by 3 different color yellows, but under a black light the effect was still worthwhile. I bought black sweat pants and top and added colored circles to the front. Unfortunately I had not fabric, so the circles on the knit mask were done on white paper, these circles didn’t look the same as the ones on the walls. All in all it was the talk of the night. I can’t tell you how many people walked past me, didn’t initially notice me or were startled when I started moving. We ended up about 2′ short filling the enter 10’x10′ room, which meant changing where guests would exit. This was a 2′ door on the same wall as the entrance, but because lacked enough sheet to cover the room, the exit door was done with hanging black plastic. Ink Blot Hallway: This idea was found on the Internet and the original concept was to have a large room with an actor sitting in the middle of the room in a chair with shackles on. Through out the entire room would be Rorshach ink blots that would hang at various heights, while the actor would be talking to himself and the ink blots, seemingly going crazy, breaking the chains and an attempt to scare the guests. Unfortunately, we needed to change the dimensions of this room and it turned into a 5′ wide corridor, which changed the dynamic of the room. Instead we used our Frank N Cuted prop as our “actor”, lined the top of the hallway with orange lights and glued ink blots on the walls. 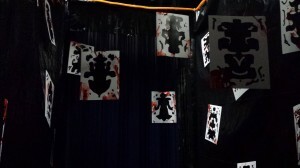 I then hung 6 ink blots at various heights facing the guests as they entered the hallway. I splattered blood on all the prints and the room looked good, but didn’t live up to the exceptions I had set. The ink blots were all homemade using Photoshop. I made 20 different inkblots and had FedEx Office print them off on a card stock. With any luck I should be able to reuse these ink blots if the decision is made to bring this room back. Labyrinth: This was another area that had to be modified as we began construction on the walls. We had to shorten up the area used, which meant redesigning the labyrinth. The best part of this haunt was that narrow, 2′ corridors. We had 2 false turns in that allowed actors to provide the scare. Floating ghosts and a crazy, killer clown hung above the labyrinth, while our severed head was tucked into a one foot wide alcove. I liked the placement of the flying ghouls, but failed on the placement of the severed head. 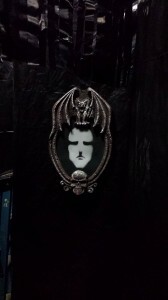 I thought we could find a better are to hang this head from, but due to some redesign on the inkblot room, we lost our alcove for our hanging head display. Much like a few other parts of the haunt, I didn’t get a chance to walk through the Labyrinth before we opened for business. I think overall, the labyrinth worked, not sure I will bring it back next year because we need more space in order to make it a bigger attraction. I think we did the best with what we had in terms of floor space. The lack of paint on the walls was a bit bothersome,, but the narrow corridors did make up for some of the missing pieces. Graveyard: I won’t do another graveyard if the haunt is indoors. This was the worst part of the entire experience. Part of that places the blame on us for setting it up this way, but the graveyard was where we staged nearly all the props and worked the rest of the haunt while setting it up. So it stands to reason it was one of the last places (the day of the event) we got to finish up. I do believe given more time we could have made this work if I had time to build a few props. I wanted to build a graveyard fence and the entrance to a mausoleum. Unfortunately, I ran out of time and the graveyard look like a collection of ghoulish things in the corner with tombstones placed giving the appearance of a pathway. A brown, jumping spider, which my wife bought was one of the two good aspects of the graveyard. It worked flawlessly all night long. The other positive to take away from the graveyard was the rolling fog effect from our fog chiller. I found instructions and a video from Make Magazine. The fog, as advertised rolled out on the ground until it warmed up and rose dissipating into the air. Purely for the effect I would like to use this fog chiller again, just not sure where or how. Overall this room left me feeling empty. We used a donated coffin (wood box) and place a 5th grader in it to scare people. This worked for most the night, before 2 teenagers got the idea to sit on the coffin and trap the kid inside. Any graveyard next year will read mausoleum and be placed outside the haunt at the entrance, where I believe it would have a better effect. 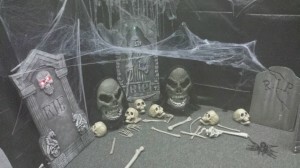 Spider’s Lair: The final haunt for our event this year was the lair. The hallway ended up being about 2′ wide. We took fake webs and with the help of some velcro hooks strung the webs overhead. The spiderwebs looked good, as we placed plastic spiders in the webs that lined the hallway. Larger, lit and unlit spiders were then hung on the walls an over doors peering down on unsuspecting guests. 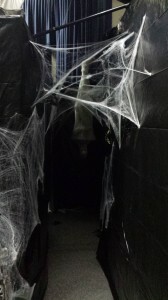 At the end of the hallway I had a hanging cobweb mummy that lit up, shook and laughed as guest exited the haunt. I had also spent about an hour creating spider egg sacs I had found created by Martha Stewart. They didn’t come out as expected, but still looked good once the lights went off and the black lights came on. Like some of the other haunt ideas I had, this corridor didn’t live up to my expectations. In conclusion, I am probably my worst critic. Looking back on the event, this haunt was better than the previous two I had been involved with. We did make very good use of the space we had on the stage, the PVC frame worked very well and was easy to break down and store. I do wish we had more help, as we could have used another body or two at times in order to make things go a bit faster. Especially during the night of the haunt I would have liked to have 1-2 more adults inside, either acting supervising. Typically it’s the 5th graders who are the actors, but nothing says I can’t use adults to help out. We had all sort of issues outside, where the wives were taking tickets to get in. First we had enough guides (5th graders) to accompany guests through yelling “scary” or “non-scary” when entering. Unfortunately we failed by only have 3 flashlights for the guides to use. This caused a massive line of people waiting to get in. Not sure how we bypassed this during construction and the weeks leading up to the Harvest Carnival. The haunt was a success, regardless of the negatives I have tossed around. The school staff and administrators were pleased, as was the PTA who made quite a bit of money on ticket and food sales. Now we look forward to next year and improving on what we created this year. I am already drawing up new plans with some new ideas in order to scare better next year.